Dr Martin Crapper and Dr Simon Smith, working in conjunction with Prof Jim Crow in Archaeology have secured £250k funding from the Leverhulme Trust for a major study on the engineering behind the water systems of ancient Constantinople. This was one of the largest water systems in the ancient world: the Aqueduct of Valens was started around 345, and took thirty years to construct, eventually extending to 150km in length and including over 30 stone bridged. 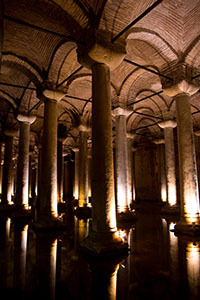 Meanwhile in the city there were around 100 cisterns storing 800-900,000 m3 of water. The system remained in use until around the 12th Century. Previous work by Prof Crow has identified and catalogued the remaining structures, but there is still little understanding of how the system actually functioned or how the materials and workforce required to create such complex infrastructure might have been procured and deployed. Dr Crapper will study the hydraulic engineering aspects of the water systems, applying modern engineering modelling techniques to investigate how water may have flowed during the various historical phases of the system; meanwhile Dr Smith will apply construction management methods to gain insight into the materials and skills required to build and maintain the structures; Prof Crow will provide archaeological and historical oversight to inform the engineering study.